Nutrition Counseling - Marci R.D. We specialize in helping individuals recover from eating disorders, disordered eating, and the backlash of chronic dieting. 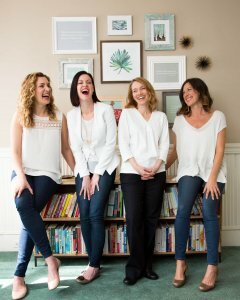 As eating disorder experts and Food and Body Image Healers® we work in partnership with our clients to tap into their inner wisdom and strength to discover a pattern of eating and moving that supports their unique mental, emotional, and physical well-being. Our approach is highly individualized and rooted in developing a strong relationship with everyone we have the pleasure of working alongside. We blend expertise in nutrition and psychology to fuel lasting transformation. Despite the seriousness of our work, there is a remarkable amount of laughter in our sessions and smiles on our faces because we love what we do. According to a recent anonymous survey of our clients, we are most often described as compassionate, non-judgmental, knowledgeable, and genuinely helpful. We believe that people inherently possess the wisdom and strength to make powerful changes in their lives. Please take your time in getting to know us more by reading through the Marci RD Nutrition Manifesto as well as our individual profiles. We provide one-on-one nutrition counseling from our office in Cambridge, Massachusetts located in the heart of Harvard Square. We currently accept all Blue Cross Blue Shield and Harvard Pilgrim insurance plans as well as Tufts PPO. If we do not accept your insurance, we can also provide you with a superbill that you can submit to your insurance company for reimbursement purposes. We have also created an insurance script to help you identify if your insurance plan will cover nutrition counseling with us. We are conveniently located in the heart of Harvard Square in Cambridge, MA. We are a 5 minute walk from the red line T-station and multiple bus lines. Metered parking is accessible on Mount Auburn and Brattle Streets. Please allow 15 additional minutes as parking availability can be less predictable. There is typically more parking in the direction of Watertown, a bit further out from the square. Our address is 22 Hilliard Street Cambridge, MA 02138. We are located on the first floor, glass door on the right hand side and down the small hallway. Please relax in the waiting area until your clinician is ready to see you.